Distribution: Widespread throughout North America except deserts. Habitat: Disturbed or weedy areas, widespread. Description: This is a very important plant to know. This plant is potentially very dangerous and is one of the most poisonous plant on the North American continent. Be respectful. It can grow anywhere from one to perhaps five feet tall. The stems are smooth and spotted or streaked with purple. The leaves are very symmetrical and can be bi- or tri-pinnately compound. 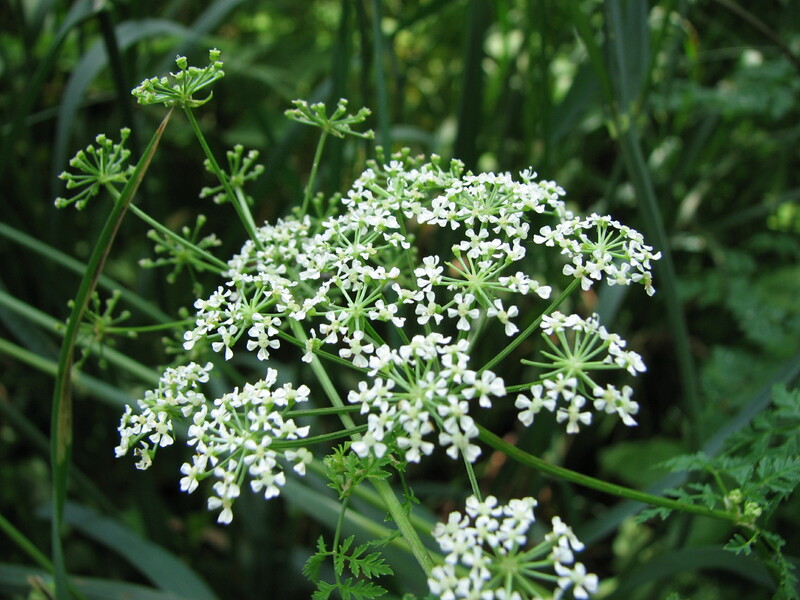 In the summer it has umbels of white flowers which resemble those of the Wild Carrot. The foliage smells very toxic when crushed or bruised. Please avoid this plant since even small amounts can be fatal. Do not touch. Habitat: I have usually seen this plant on the edges of civilization. Railroad tracks or the edge of town. Poisonous: Extremely toxic. Kills by paralysis. Avoid this plant. Do not touch it and wash your hands if you do accidentally touch it. Other Notes: This is the plant that killed Socrates. Click here for Plato's description of the event.